Kaikai Kiki Gallery is pleased to mark the third in our series of exhibitions by ceramic artists with a solo exhibition by Aso Kojima. Kojima has fascinated us over the last few years with glimpses of his creativity and lifestyle, gleaned from numerous visits to his rural production studio. Declaring himself half-farmer, half-ceramic artist, he is a creator who has worked production into the rhythms and routine of his daily life, a division of labor which gives him a vitality unparalleled by others in his field. In an almost unheard of move within ceramic circles, Kojima is also entirely self-taught, never once having apprenticing himself to a specific teacher. From kikuneri (the technique in which clay is prepared for shaping by kneading out air bubbles) to calcination, the operation of a kiln, and even the construction of his living quarters and the gallery, Aguraichi, he has attached to them, everything has been learned and developed through self-study. It has been, for the artist, a process of withstanding numerous failures and challenging himself until he reached success. For this new solo exhibition, we would like to explore this agrarian lifestyle Kojima has chosen on equal footing with his creations. The origin of Kojima’s current activities lies with the hit 1981 television series “Kita no Kuni Kara” (From the North Country). The lifestyle of the show’s main character inspired Kojima to begin studying agriculture by visiting various farms all across Japan. At the end of these travels, he found himself at the residence of a ceramic artist and from there began his interest in pottery. 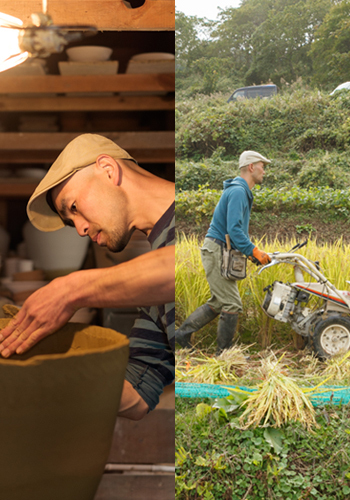 He returned then to his hometown of Nagano and began a back-to-roots, self-sustainable lifestyle in which he and his family live together on a land managed entirely with their own sweat and eat food served on pottery created by Kojima’s own hand. A typical day for Kojima begins at 5 am, when he and his family awaken to begin caring for the farm’s various plants and animals. He then proceeds to such tasks as collecting natural honey from the honeycomb he raises. The compensation for this labor is safe and stable organic living. Next Spring, Kaikai Kiki will publish a volume that collects a whole year’s worth of thoughts and images from Kojima’s farm. It will of course focus heavily on his creative activities but also illustrate the resilient way in which he has adapted to life among nature. As the genre of lifestyle pottery continues to evolve, we intend to show how Kojima’s practical living contrasts with the idealized “easy life” currently promoted by others in the field, those who enjoy only its benefits. And for this solo exhibition, we will present works made in several different styles, including Mishima-e, Tetsu-e, Yakishime, and Hakeme styles, among others. Made without adherence to any one method, Kojima’s work is thus notable for its flexibility, in contrast to the stoicism of his lifestyle. We are also pleased to note that there will be over 1000 new works, made especially for this exhibition. Kojima will be present at the gallery on December 21 for an artist talk. Join us as we discuss his practice, his lifestyle, and from there, the nature of art itself.